In late December 1862 Union general Ambrose Burnside developed plans to march across the Rappahannock and execute a massive turning movement against Confederate general Robert E. Lee’s troops entrenched along the southern banks of the river. Burnside hoped to ring in the new year by trapping Lee and his Confederates against the river, capturing his army, and redeeming the recent Union defeat at Fredericksburg. In so doing, he would also establish a strong position for marching against Richmond, the ultimate Union goal. Under ideal conditions, Burnside’s plan was viable, if risky. However, as often happens in war, conditions were nowhere near perfect. This document was originally published by the University of Georgia Press in The Blue, the Grey, and the Green: Toward an Environmental History of the Civil War. Copyright restrictions may apply. Brady, Lisa M.. (2015). 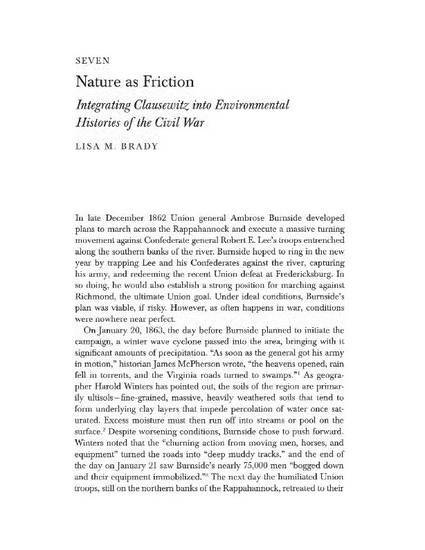 "Nature as Friction: Integrating Clausewitz into Environmental Histories of the Civil War". The Blue, the Gray, and the Green: Toward an Environmental History of the Civil War, 144-162.